The Duhawk football team rolled their way to an easy victory in front of a huge homecoming crowd on Saturday in the Rock Bowl. Behind 605 yards of total offense and a whopping seven sacks from the defense, the Duhawks beat the visiting Prairie Wolves of Nebraska Wesleyan 44-20. The Duhawks started with an early 21-6 lead courtesy of sophomore Noah Sigwarth, who had three touchdown passes, with one to freshman Elijah Thomas, one to senior Brad Boelkow, and one to junior Sam Maloney. The Prairie Wolves later cut the Duhawk lead to 21-13 and later 28-20, but never took the lead. 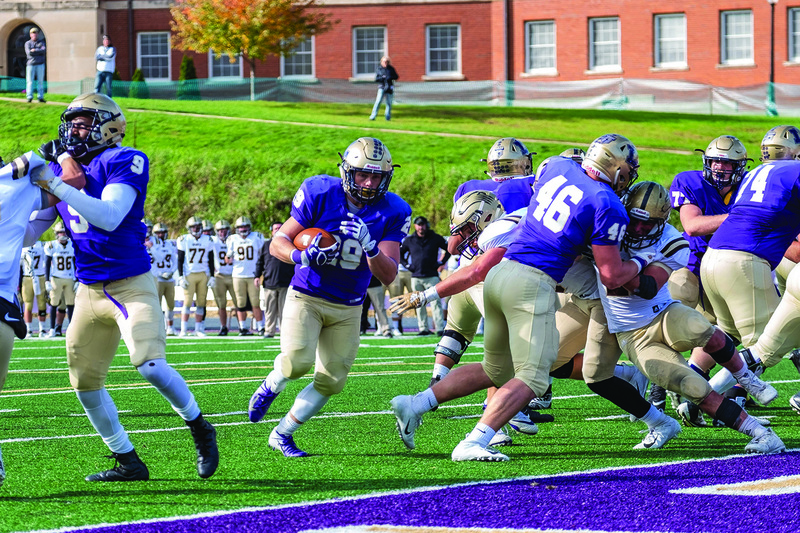 The Duhawks went wire to wire Saturday, leading for all 60 minutes of football. Sophomore Dalton Bauer (right) and junior Sam Guyton (left) help create a huge hole for senior running back Cody Mighell to waltz into the end zone during Loras’ 44-20 Homecoming victory over Nebraska Wesleyan Saturday at the Rock Bowl. Senior running back Cody Mighell scored the two dagger touchdowns for the Duhawks. He punched it in from one yard out to stretch the Duhawk lead to 35-20 with 4:59 remaining in the third quarter. A field goal from first-year Timmy Tischer with 8:53 remaining in the final quarter made it 38-20, and a 66 yard touchdown run from Mighell just 52 seconds later put the nail in the figurative coffin for the Prairie Wolves, bringing the score to 44-20. While the Duhawks were firing on all cylinders on the offensive end, Coach Steve Helminiak’s defensive unit had a monster day, coming up with seven sacks, nine quarterback hurries, and 11 pass breakups, holding the Prairie Wolves to only 92 yards through the air. Standout Nebraska Wesleyan running back Shaka Taylor did break off a 62 yard touchdown in the third quarter, but the Duhawk defense proved very stout otherwise. Juniors Walker Even and Chris Miller led the Duhawks with 12 and 10 tackles, respectively. Sigwarth had a career day, completing 18 passes for 341 yards and four touchdowns while only being intercepted once. The quarterback also ran for 50 yards. Mighell led the explosive Duhawk running attack, with 108 yards and two scores. Junior Jerry McDaniel chipped in with 67 yards. Sophomore Sam Maloney caught six passes for 148 yards and two scores, while junior Brad Boelkow caught six passes for 87 yards and a touchdown. Special thanks to Mr. Jimmy Naprstek and the Loras Sports Information Department for the statistics. The Duhawks (4-2, 3-1 ARC) will look to continue their conference success next week versus the Simpson College Storm (4-2, 3-1 ARC) in Indianola, Iowa.